The first few things worth knowing about Jules Massenet might be these. Born on 12 May 1842 at St. Etienne, near Lyons, he was taught piano by his mother and – the family having moved to Paris when he was six – gained entry to the Paris Conservatoire aged 11. When the family moved back south, to Chambéry, closish to where they were previously, Jules aged 12, and determined to pursue a musical career, ran away from home. This escapade – he was spotted on Lyons station – proved his determination. But it also makes a more important point. Any idea that he was a mere hack composer, devoid of any special imagination or initiative, founders. 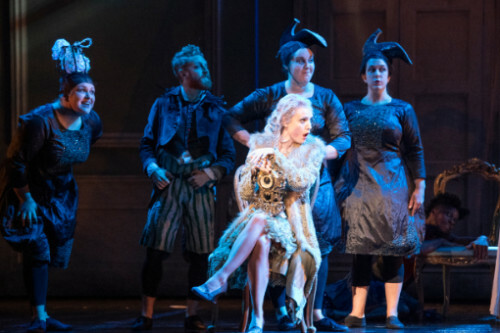 Indeed, Glyndebourne’s championing of him – Fiona Shaw’s feisty, really rather brilliant staging of Cendrillon will reappear next season, when it is broadcast live in cinemas nationwide on Sunday 30 June – coinciding with 2019 Main House productions of gems such as Rusalka and La damnation de Faust – is heartily to be welcomed. I hope they will return to him (Wasfi Kani’s Grange Park Opera, when it was still outside Winchester, had a go at Thaïs with their usual inimitable initiative, and considerable success. Massenet is sometimes, perhaps often, both inside and outside France, seen as a bit of a workaday composer. He had generous encouragement from Adolphe Adam, a major figure of mid-19th century Parisian opera. His use of chromaticism, it has been noted, is not Wagnerian – Lohengrin, perhaps, but never Tristan. But his youthful character does not bespeak musical acquiescence or unoriginality, as Duncan Ward’s prising out of great swathes of magnificent, and fresh, compositional detail here at Glyndebourne showed. Running away to pursue his chosen art puts Massenet firmly in the category of the young poet Arthur Rimbaud; or of equally young (Achille-) Claude Debussy who was famously truculent as a teenager (ostentatiously revolting against the more conservative Conservatoire), until saved by his best mentor and friend Ernest Guiraud, and by his travels and sojourns with Madame Nadezhda von Meck, Tchaikovsky’s patroness. All three were admirably headstrong youths, and Massenet, it could be said, showed equal determination to the others. Like Debussy, who also entered the Conservatoire in 1872 aged just 11, and who was taught (another coincidence) for 3 years by Mme Antoinette Mauté de Fleurville, a pupil of Chopin, (and, incidentally, the mother-in-law of the teenage Rimbaud’s fellow-poet and passing lover, Paul Verlaine), Massenet won the coveted Prix de Rome (at second attempt: Debussy fared even better, winning twice). All this contextual detail might seem not to the point, but I think it is, and I think Glyndebourne with this frankly glorious production – not quite up to Saul, perhaps, which was so stunning, but still marvellous for the way Fiona Shaw, despite some distractions, not only worms her way into the Cinderella story – any director can do that, just as virtually anybody could produce an entertaining Fledermaus – but gets to grip with the difference in Massenet’s version. It is not the Rossini story (or indeed that of Isouard (1773-1818), whose Cendrillon with typical flair Bampton staged this July: Massenet’s emphases are different – witness the crucial role here of the ghastly, indeed brutal stepmother (fabulous Polish mezzo Agnes Zwierko, who has already done the role for the Berlin Komische Oper): far worse than the two ugly sisters, who are rotten eggs enough (Portuguese soprano Eduarda Melo and as the mezzo sister another accomplished Pole, Kezia Bienek, formerly GT’s Suzuki), perhaps slightly at the (visually at least) suitably revolting pair’s expense, this being perhaps a directional weakness by Shaw (was there a hint of Amy Winehouse about costume designer Nicky Gillibrand’s tastelessly cross-gartered leggings for the latter? In the acting stakes, Zwierko’s hilarious histrionics apart, the accolades are easy to distribute: perhaps the designers first: set designer Jon Bausor let us have a glimpse of a previously well-to-do household, but he plotted everything so well, so perfectly one wants to say, with his lighting designer Anna Watson – right down to the fabulous not bottle-green but absinthe-green backdrop to several scenes – that the eye was constantly teased. The alternations between the (occasional, and very clever) frontdrops and what was revealed behind them – always different – felt to me ingenious. But the cast, too: one remembers William Dazeley in one of the first of his many roles for Glyndebourne – as an incredibly touching Owen Wingrave. Now he gave us a moving Pandolfe – no down-on-his-luck minor aristocrat but husband, in his second marriage, to a henpecking minor Countess. He is as much kicked around as his daughter Lucette: for Madame de la Haltière is as vile a stepmother (in traditional Panto vein) to Lucette (Cinderella: the wonderful Alix Le Saux, who started singing with the children’s choir of the Paris Opéra at roughly the same age as Massenet and Debussy entered the Conservatoire) as Caroline Wettergreen’s stupendous (good) Fairy is tender, wise, supportive and loving. With the Norwegian and Danish-trained Wettergreen (who again took the same role for the Komische) rooting for her – and if Massenet uses coloratura sparingly, it was simply stunning when she embarked on it, rather stylish and not overbearing – Cinders was always going to win. What about the Prince? Gillibrand deliberately dressed him down – a trick one has seen in other opera productions, but one I happened to like here, because it turned the focus onto the voice of soprano Eléonore Pancrazi, Corsican-born and Paris-trained. What a sensational duo he/she, the sensational travesti role, and Le Saux’s Lucette made together. Were we hearing a genuine Paris sound, so exquisitely did they match and parallel and meld into each other. Duets composed of equal voices have a definite habit of tickling the parts Heineken can’t reach. The directing of Prince Charming, curiously half hidden in a kind of cupboard, may have been the least successful bit of Bausor’s really exciting revolving door creations, so especially entrancing where mirrors where employed to gobsmackingly beautiful effect, but I think I sensed what Shaw was up to. Here was no showy royal, but one almost disturbingly self-restrained. For the twosome to work, certainly in Massenet’s and his librettist Henri Cain’s intention, the Prince has to be of equal modesty and moral purity to Cinderella herself. He has to be …. Beautiful. Arguably Massenet’s Prince is closer to the 1698 Perrault original version of the story. Both were marvellous. It was marvellous. The choreographing of a clutch of Brittenesque assistant fairies (by Sarah Fahie) was quite clever: we saw a bit too much of them, and their movements seemed sometimes relevant, sometimes merely a doubtful bonus. Did we need them? No. Did they contribute something? Yes. ‘Cendrillon’, wrote the endlessly acute and much-missed Rodney Milnes in Grove Opera (whence the titbits about the boy’s early life are culled), ‘is the Massenet opera most readily approachable by those with reservations about his idiom’. What seemed to me so overwhelming – it has been recognised by some, but not all – is the placing of Massenet’s operas, or certainly this one, in the musical canon. There is no doubt at all that Debussy, despite the odd dismissive as well as appreciative remark, leaned quite heavily on Massenet as a starting point. You hear, not just occasionally but constantly, Pelléas on the way. Perhaps Rodrigue et Chimène and L’enfant prodigue as well. There’s Puccini galore, maybe Leoncavallo and the rest as well. This composer was a gold mine. And composers dived into him like jackdaws. A Glyndebourne success? You bet. A revelation in repertoire, proving that Gus Christie’s willingness to take some risks is a huge asset? You bet too! I won’t listen to anyone hereafter who tells me that Massenet’s 36-odd operas are boring or old-hat or unoriginal. He was a star, and Shaw’s Glyndebourne Tour team are stars for giving it to us full-frontal. For more about Glyndebourne on tour click here.